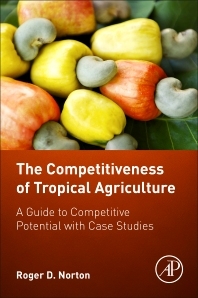 The Competitiveness of Tropical Agriculture: A Guide to Competitive Potential with Case Studies describes and synthesizes existing methodologies for evaluating competitiveness in agriculture, introduces extensions and refinements, and provides a novel approach based on a combination of quantitative and qualitative methodologies. As exports of tropical fruit, nuts, and other high-value crops have been growing very rapidly from developing countries, but often encounter serious obstacles in their value chains, this book demonstrates how national agricultural policy is oftentimes not guided by considerations of inherent competitiveness. In addition, the book presents case studies that illustrate the application of these approaches using quantitative frameworks. A concluding chapter introduces policy considerations for competitiveness from work in Jordan, Colombia, Estonia, Peru, and elsewhere, also discussing the role of specific policies in raising competitiveness sustainably and its role in reducing rural poverty.